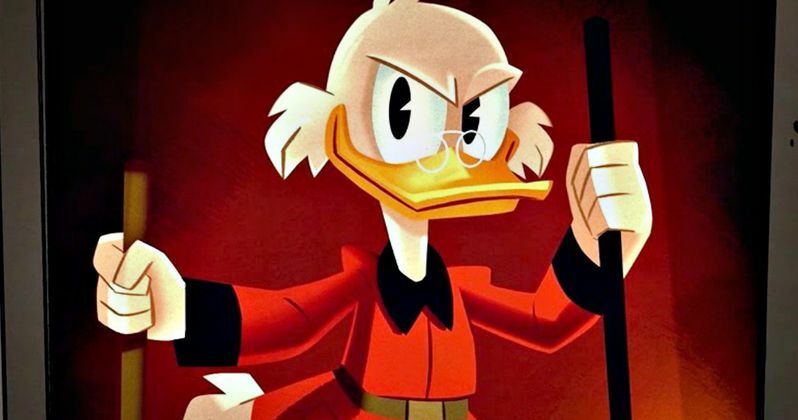 As the song says, DuckTales is set to rewrite history. An all-new take on the Disney classic is coming to Disney XD soon. But it won't be a one season and done deal. The network has already renewed the animated series for Season 2. And in doing so, they have also released the full-length trailer, giving fans their first look at this refurbished staple of afternoon syndicated television. Disney XD released this latest look at DuckTales on their Youtube Channel, and right away, fans will notice a completely different style of animation is being used. The humor is aimed at children as well as adults, and even includes jokes about child trafficking and senior moments. The action and adventure packed into this 90 minute clip make it stand out from the usual Cartoon Network fare, and it appears like it will be a hit with hip audiences looking for a bit of nostalgia. DuckTales originally aired on afternoon television, debuting in 1987 and running until 1990. This updated version is sticking pretty close to the main storyline, with Scrooge McDuck reclaiming his title as one of the most adventurous soles to ever walk the planet. One noticeable difference between the old show and new, aside from the slick new animation, is that this version boasts a rebooted voice cast. The nephews no longer sounds like high-pitched bicycle horns. The cast actually has quite the fine ensemble. Starring are David Tennant (Jessica Jones) as Scrooge McDuck; Danny Pudi (Community), Ben Schwartz (Parks and Recreation) and Bobby Moynihan (Saturday Night Live) as Huey, Dewey and Louie, respectively; Beck Bennett (SNL) as Launchpad McQuack; Toks Olagundoye (Castle) as Mrs. Beakley; and Kate Micucci (The Big Bang Theory) as Webby Vanderquack. Disney XD has yet to announced a release date for DuckTales. But we do know that it will return this summer. And it was announced today that Disney is so happy with the outcome of the reboot, that they're definitely moving forward on more new episodes in the future, with a second batch expected to drop in 2018. Disney XD had this today when launching the trailer today. "A first look at the all-new family comedy-adventure series DuckTales premiering this summer on Disney XD. The series stars David Tennant as Scrooge McDuck; Danny Pudi, Ben Schwartz and Bobby Moynihan as the voices of Huey, Dewey and Louie, respectively; Kate Micucci as Webby Vanderquack; Beck Bennett as Launchpad McQuack and Toks Olagundoye as Mrs. Beakley, and will follow the epic family of ducks on their high-flying adventures around the world." So, if you are jonesing for some DuckTales madness, this sneak peek should be enough to tide you over through spring. It looks like this is going to be an exciting summer for TV, with plenty of new shows lined-up at various networks. But we doubt anything will hit that nostalgia nerve quite like this beloved animated classic. How longtime fans respond to the new look, humor and voice cast has yet to be decided though. Take a look and hold on, this is going to be one fun ride.